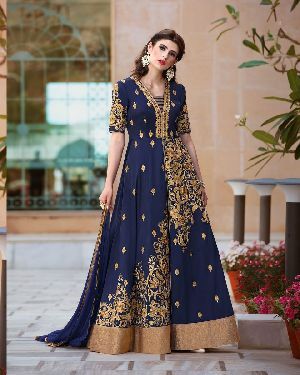 Urban Naari Navy Blue Colored Taffeta Silk Heavy Embroidered Semi Stitched Salwar Suit. Urban Naari Pink Colored Banglori Silk with Banarasi silk Koti Heavy Embroidered Semi Stitched Salwar Suit. Urban Naari Black Colored Taffeta Silk Heavy Embroidered Semi Stitched Salwar Suit. Urban Naari Teal Colored Banglori Silk And Net Heavy Embroidered Semi Stitched Salwar Suit. Urban Naari Copper Colored Silk Heavy Embroidered Stitched Salwar Suit. Urban Naari Black Colored Faux Georgette Heavy Embroidered Semi Stitched Salwar Suit.